"The Nightingale worked closely with Terry and his excellent team at LDG to produce a stunning new design concept for the club. 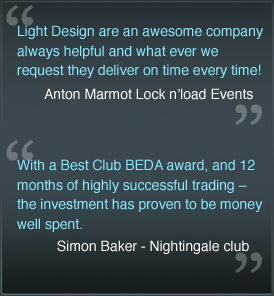 With a Best Club BEDA award, and 12 months of highly successful trading ...">> read more – the investment has proven to be money well spent, and our customers have been thrilled with their new look venue." "Our requirements for a new sound, lighting and video system were fulfilled with an innovative, flexible design created by Terry Lewsey at Light Design after his careful study of our business and buiding ...">> read moreThe installation and commissioniong was undertaken by his dedicated team of enthusiastic, skilled and knowledgable people who demonstrated drive and enthusiasm in creaing the right atmosphere for our business."